Recently it seems like we hear about another major earthquake almost daily. Which leads one to question, "Am I prepared should a natural disaster occur near me?". Exeprts say that everyone should have enough food and water to last their family at least 6 days. Are you prepared? Would you have enough in your pantry to last your family 6 days, as it may take at least that long for crews to restore power and water supplies. 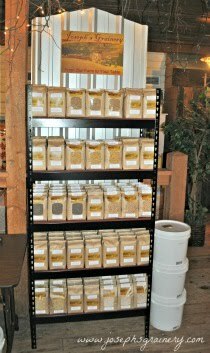 Joseph's Grainery whole grains are an excellent way to stock your pantry for these types of situations. Our grains have a long shelf life and with just a little boiling water, you can make a hearty cereal that will nourish everyone! Order some whole grains today and you won't be caught without!